With its impressive architecture, guests are enchanted right from the start. 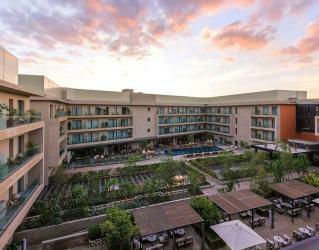 The superb location, executive facilities, modern guestrooms and the greenery all around make it a gem for the guests. A perfect way to experience the Moroccan culture, the hotel offers delicious culinary options, splendid views and a comfortable stay. Kenzi Club Agdal Medina combines a full range of leisure activities, delightful culinary options and a contemporary design making it a favourite spot among guests. The brand new Club offers an all-inclusive concept is sure to make this an unforgettable experience. 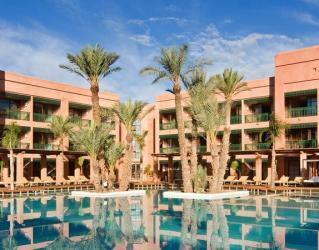 The 5* luxury Palmeraie Palace is an outstanding golf hotel in Marrakech. 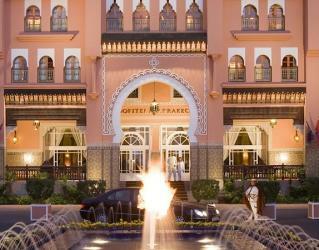 The traditional Moroccan architecture of the hotel is stunning and offers its guests a genuine Moroccan experience. Just a few minutes from the Marrakech city centre, this heavenly oasis is a gem within gorgeous greens. Offering superb facilities, luxury rooms and exquisite culinary options this resort ensures a unique holiday experience. The stunning views of the majestic snow-capped Atlas Mountains are breathtaking. This top class resort is an excellent choice for golfers looking to combine a distinguished stay with the joy of playing golf. Designed by famous architect Imaad Rahmouni, this modern hotel features a beautiful lobby, patio and spa. It’s a striking contrast to the city’s historic quarter located just 10 minutes away, where you can explore the Djemaa El-Fna square and traditional souks. The resort offers its guests a luxury restaurant and bar that offer local and international delights. 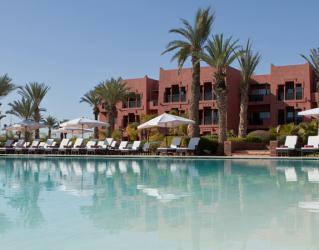 The Es Saadi Resort has a prime location in the residential Hivernage neighbourhood, overlooking the Atlas Mountains. 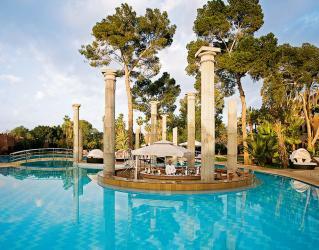 Just steps from the walls of the old city and the Menara gardens, a short ten-minute drive to the airport. 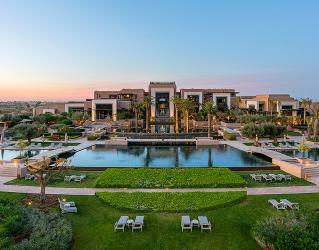 Fairmont Royal Palm Marrakech Hotel is a unique place for five-star golf holiday lovers. 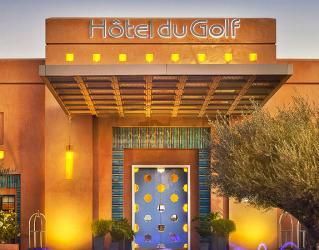 The hotel features a spectacular 18 holes golf course behind the view of Atlas Mountains. Only twenty minutes away from the traditional streets of Marrakech. Comfortable 134 units and 10 Princes Villas offers peace and joy. 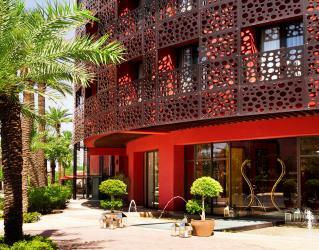 The Pearl Marrakech Hotel has 71 rooms and suites with an area of 46 to 220 m2. They also host an opulent 2000m2 spa: The Pearl Spa. An eclectic dining offer includes the all-day dining at the La Galerie, the Japanese Namazake restaurant, the Italian Del Café restaurant, the Sky Lounge and The Pearl Club in chic and modern settings. Es Saadi Marrakech Palace set in 8 hectares of gardens at the heart of Marrakech. Guests at the hotel can enjoy a wide variety of international restaurants, amazing non-stop night shows and spacious golf courses. Also, you can relax with indoor and outdoor swimming pools during mild days. 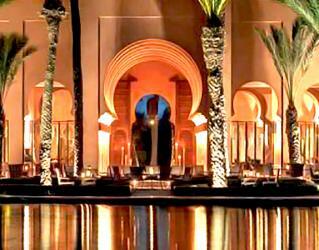 Es Saadi Marrakech Palace’s extensive spa complex is also a desirable place to treat yourself. Hotel du Golf gives excellent service to golf holiday lovers with 5* comfort. The luxury and friendly atmosphere invites you to enjoy Moroccan or International Cuisines, fabulous golf course with views of the Atlas Mountain, modern and traditional eclectic rhythms at the Mariinki Russian Club. Several stunning spa treatment options or a Turkish bath is waiting for you. Marrakech's luxury Hotel Royal Mansour Palace traditional architecture, stunning gardens and outstandingly sophisticated riads await you. Palace protected by the walls of the imperial city. Enjoy the unique accommodation concept, spacious terraces under the palms and Moroccan hospitality culture. 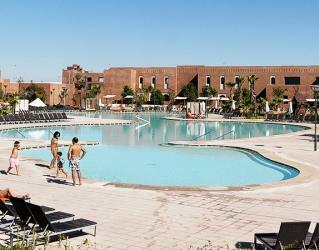 Mövenpick Hotel Mansour Eddahbi Marrakech offers an authentic welcome to visitors of the captivating Red City. Just a few minutes away from the bustling Medina in the central L'Hivernage district, 5-star hotel features 503 rooms, four restaurants and one bar, Ô de Rose spa and wellbeing centre that includes a yoga studio, vibrant gardens and three magnificent swimming pools, including a luxurious heated facility, and a kids club. 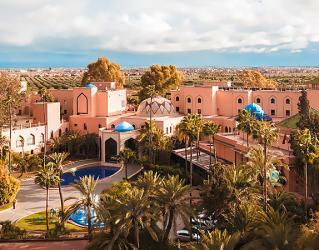 The hotel also connected to Palais des Congrès Marrakech, also managed by Mövenpick Hotels & Resorts; it's the largest venue in Marrakech. Offering; exhibition space, auditoriums, meeting rooms and banqueting venues.